They changed the schedule of our classes (as we head into our last two weeks at Centro Machiavelli). We have grammar in the afternoon instead of the morning. So now our mornings are free. We think it will be nice because a number of museums are open in the morning and close early in the afternoon and we had not been able to visit them. But no museums today -instead we headed to the San Lorenzo market (which is a morning affair as well 7am – 2pm) and did some shopping. Okay, Mark shopped and I mostly watched. 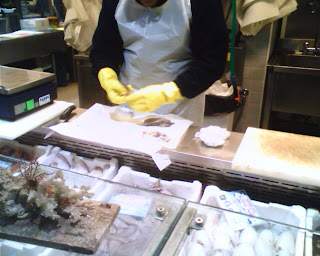 One photo shows a guy cleaning some calamari that we bought. It was only a couple of bucks for fresh calamari and mussels. 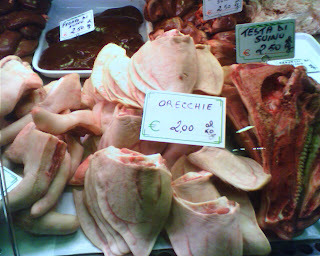 The other photo shows some pig parts (orecchie – ears, testa – head, fegato – liver).